Improving favorability for President Trump and the entry of the Green Party candidate are among the factors pollster Mike Noble says explain the recent change in the race. A new poll of Arizona's contested Senate race shows frontrunner Republican Martha McSally increasing her lead over Democrat Kyrsten Sinema. 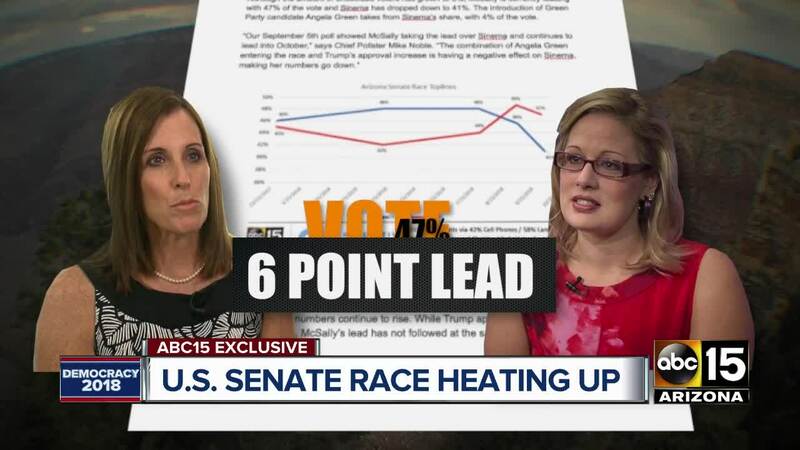 In the latest ABC15/OH Predictive Insights poll, McSally has a six-point edge on Sinema, 47 percent to 41 percent. Eight percent said they had yet to decide on a candidate. Both candidates received less support than they did in September when McSally held a 49-46 margin, the first time ABC15/OHPI polling showed her in the lead to replace retiring Sen. Jeff Flake. 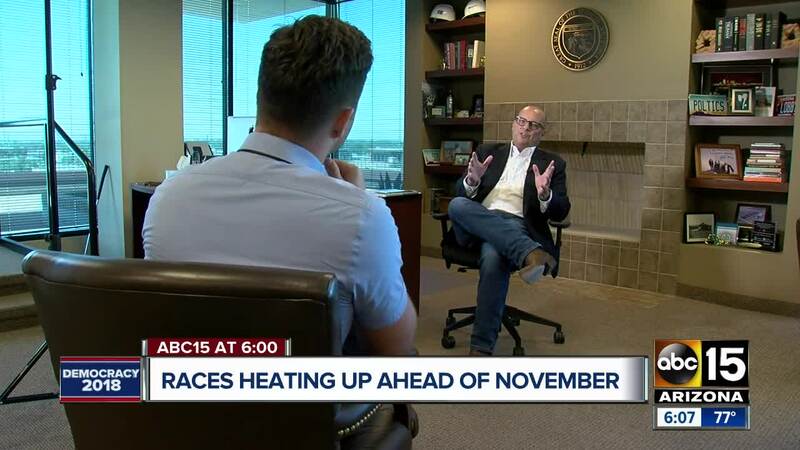 Chief pollster Mike Noble said increasing approval for President Trump in recent weeks and the addition of Green Party candidate Angela Green, who received four percent in the poll, to the race have contributed to the separation between McSally and Sinema. "What we saw all year was Republicans were less united compared to Democrats, who were more united or fully united," Noble said. "So whether they disliked Trump or had issues with the establishment, now what we've seen is [the] Kavanaugh confirmation process has really brought all those Republicans home and has solidified the Republican base, hence why you're seeing all the favorable numbers toward McSally." However, Noble isn't sure whether the energy provided to Republicans by the confirmation of Brett Kavanaugh to the Supreme Court will last until November 6. "Since Kavanaugh now has been confirmed, will that hold from now until Election Day? Or, since getting confirmed, do [Republicans] correct back to their previous position? [That] obviously would be not good for the GOP and great for Democrats," Noble said. The poll, conducted October 1 and 2 through a mix of cell phones and landlines with likely Arizona general election voters, has a margin of error of plus or minus four percent. The sample of 600 respondents has demographics accurately reflected party affiliation, gender, region and age.